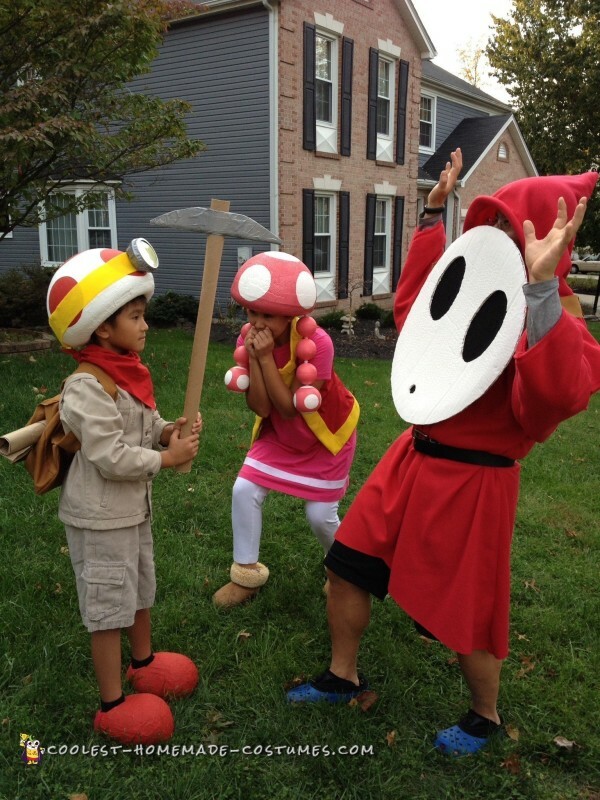 Here are our cool Mario Brothers costumes – Captain Toad and Toadette are on the adventure of their lives, dodging the dreaded Shy Guy as they gather treasure. Every year Ben (my son) picks out a theme and I make the costumes. 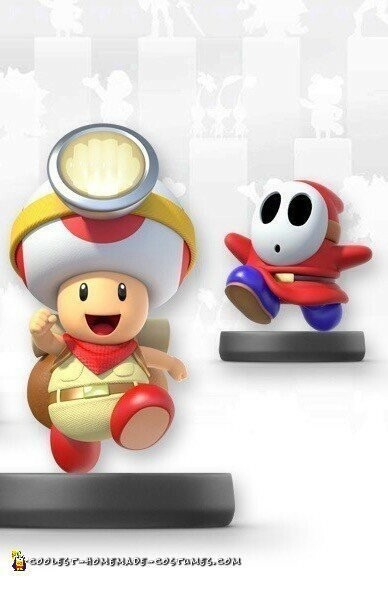 Ben (Captain Toad) is wearing a homemade mushroom cap, homemade backpack, homemade shoes, and holding a homemade pickaxe. I (Toadette) am wearing a homemade mushroom cap, an altered dress, hand-sewn vest and boots. Shy Guy (my wonderful, obliging significant other) is wearing a homemade robe, homemade hoodie, and homemade mask. 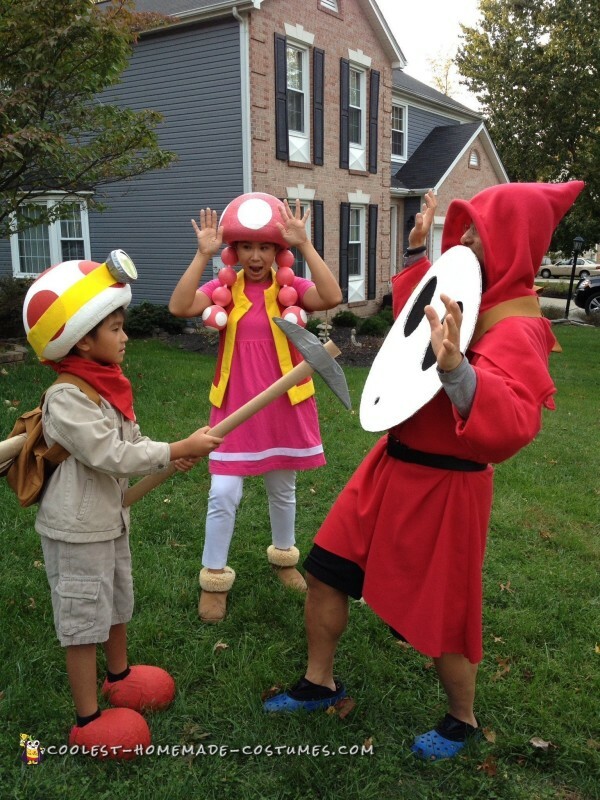 The most challenging part of these costume was the mushroom caps. After much Googling and searching, I opted to make them instead of purchasing. They are made of craft foam and a refashioned swim noodle, lots of paper-mache. Ben had a grand time applying paper-mache to my arms instead of the caps. 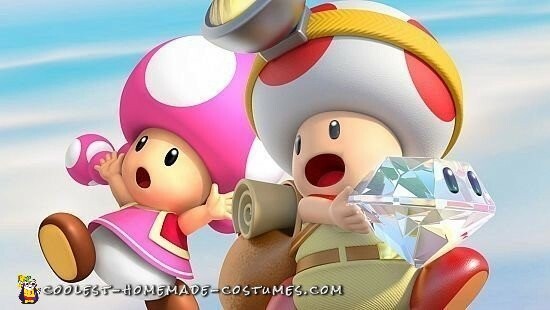 For Toadette’s hair we used 4 foam craft balls. I drilled holes into the balls and inserted pipe cleaners with hot glue gun to attach them into each other and Toadette’s cap. Ben painted each cap, one white and the other pink. I traced circles on to each cap and Ben, then, painted them in. Ben’s shoes were made with paper-macheed balloon forms. Ben painted them and I attached them to a pair of old shoes with good old duct tape. 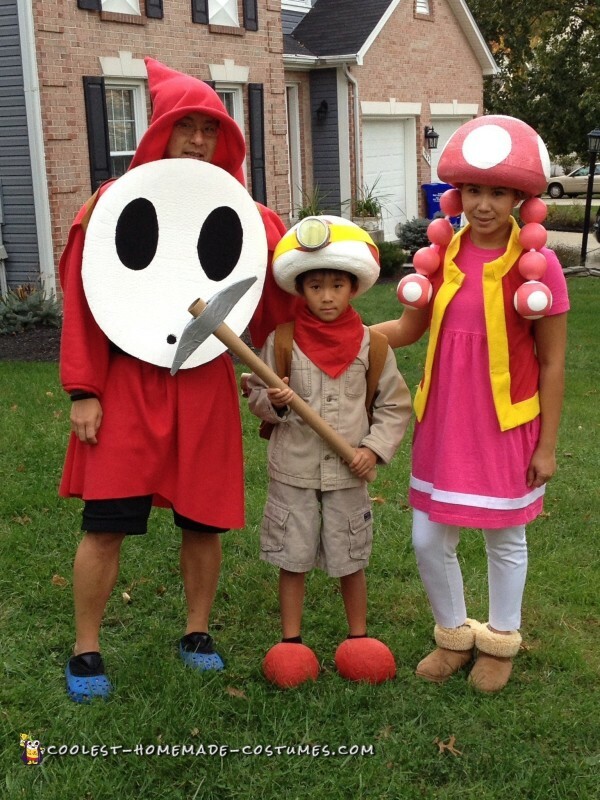 Thanks to high school home economics, I was able to sew Captain Toad’s backpack, Shy Guy’s robe and hoodie, and Toadette’s vest. 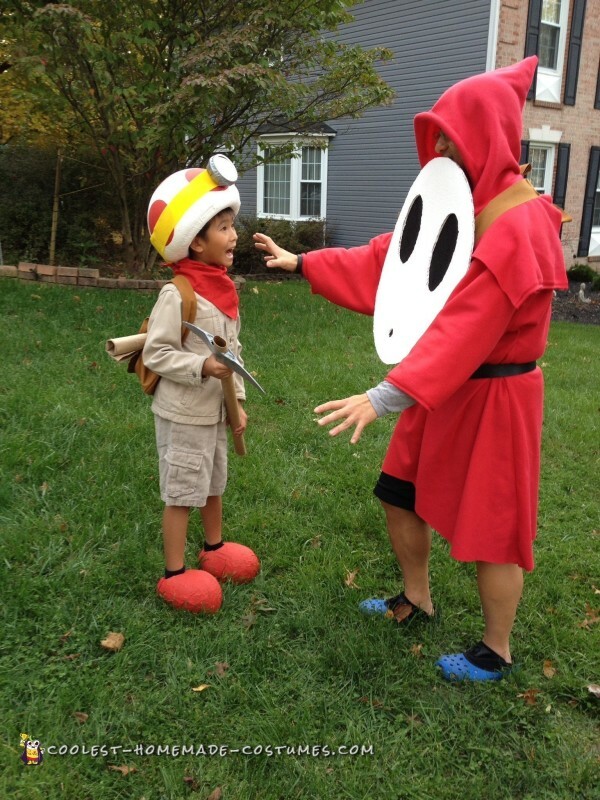 Shy Guy’s mask was made from cardboard. I free-handed the outlines for the face, eyes, and mouth and cut all out with a sharp knife. Ben painted the face white. I blacked the eyes and mouth with black felt, using a glue gun to attach it all on. Ben and I both had a great time making these Mario Brothers costumes. Ben’s reaction to the completed costume was the treat in making these costumes. Cool Minecraft Costume – Stampy Comes Alive!